2. People in adjoining streets, who are on the neighbourhood watch groups are reporting the same slow speeds. 3. I see periods of dead internet in other words, an established PPPoE session remains active but no data is able to be transferred. During one of these, a few weeks ago, as an experiement I forced a PPPoE reconnect and I found that the router couldn't get a PPPoE session established until 10 minutes later. Nowadays I do not fiddle with the router, I just wait it out. 4. Because of local CDNs we don't see issues on Netflix, although that has started to buffer the last few days. This past weekend was abysmal, we ended up going back to the media library on hard disk. 5. The internet was perfect between the 18th of December 2018 right until the 14th or so when it started to get back to the usual rubbish I experienced right from the first day of connecting the router. This change perfectly corresponded with the traffic in the area, which means its perfectly accurate to assume it was because everyone went on holiday. i have had this conversation with their engineers before. they try to get the isp not to use pppoe over ther network, like rsaweb did eventually. not all the isp want to play along though. LoL Arty..... you know there will always be those idiots that think they know better. This place is full of them. Just wait until they have an issue, then its "This provider has always been this bad". You should mail this thread link to them. Don't know hey, Vumatel is like 5 roads away from you guys in Blouberg Rise. 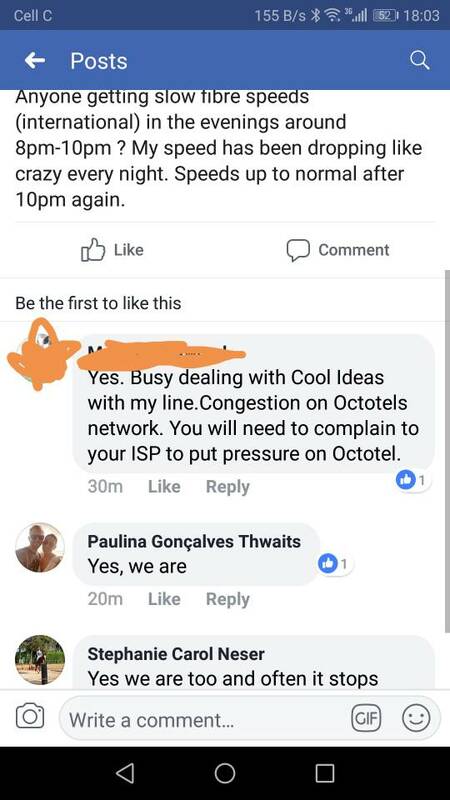 Get the people around to also lay complaints and see if that might get them to do something..........and make sure people are complaining to ISP/Octotel. Some of them are already making their voice heard in the Cool Ideas Feedback thread..
thank you for bringing this to light, I was hoping to jump off Telkom/CrystalWeb combination which has been great for me in favour of Octotel Fibre in the Muizies, now i dont see that happening. I will stick with my crystal a little while longer. And yet nothing is being done... I still don’t even have an answer from Cool Ideas but, I really don’t care anymore. i activated speedtests every 30minutes after reading this post(thread), just to make sure im not, not noticing lower than expected performance. my connection is as steady as they come for 100mbps with ips and smart queuing enabled. Location? And for which hours did you run the tests? Mine got better on its own. Seems pretty normal now.